You’re sharing great content on Facebook. You have tons of Facebook likes who share and comment on everything you post. But why are none of them are becoming paying customers?!! My guess is that you’re not creating content that drive sales. You don’t want to make posts that are funny, but have nothing to do with your products. And you don’t want to make posts that are solely about your products. You want to tell an interesting story that includes the product. In this post I’ll show you 4 ways to create posts that turn Facebook Fans into paying customers. Coupons are a great way to bridge the gap between Fan and customers. It’s not a hard sell, but an incentive to browse your products. By Liking your Page, Fans have displayed an interest in your business. But this may be because you post interesting content, not because they buy products from you. For those Fans, who may have never purchased from you before, a “Fan-only”, “Thank you for Liking us!” coupon will entice them to make their first purchase. A study by ExactTarget and CoTweet found that 40% of people Like Facebook Pages to receive discounts and coupons. Coupons are FREE: A coupon is like a ticket. You claim it and it’s yours to use as you wish. It’s a way to get into a special place. It invites curiosity to browse without making a hard sell. Discounts have a price tag: A discount is a hard sell of a product. It asks you to buy the product NOW at a certain price. 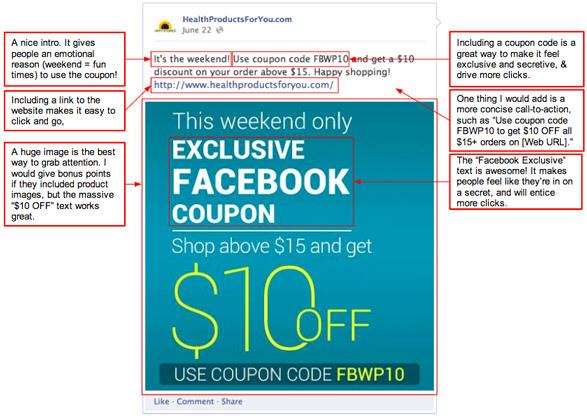 How do you create a coupon on Facebook that will maximize sales? 2. Image of what you can buy: Show them your most enticing products so they can see something they want to use the coupon on. If they don’t think you sell anything they want, they’ll have no reason to claim the coupon. 3. Description of how you use it: Don’t leave any questions. Tell them exactly where and how to use the coupon so they feel confident enough to click. 4. Very small amount of text: The shorter the better. People don’t read on Facebook, they skim. And if they see a wall of text they’ll likely skip over the post completely. My rule of thumb is to keep your posts to 140 characters, just like Tweets. 5. Coupon/Promo Code: A coupon code is a great way to add to exclusivity of the coupon - as only people who know the code can use it. Promote your coupons as “Fan-Only Exclusive Secret”. It can drive more clicks and sales from people simply because they see it as exclusive - something you can’t get anywhere else. If people believe they have the ability to take advantage of an opportunity that few other people can, they will be more enticed to do so. The rise of Gilt Groupe, through its model of “Private Sales” proves how addicting they can be. A product by itself is boring. It only becomes exciting when you show people all of the cool things you can use it for. If you post a photo of a hedge trimmer no one will care. But if you show a hedged trimmed to look like a giraffe with a link to see how to do it, people will be interested. The example from Walmart (below) is great. 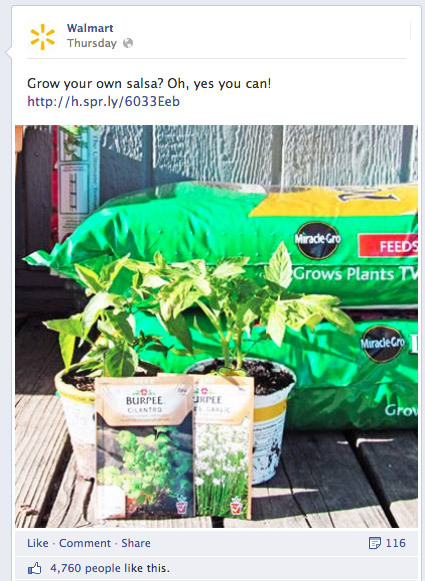 It sells the products necessary to grow your own salsa without even mentioning them in the text. Instead, they show them in the photo of a typical backyard. In this way, the text is kept short and punchy. The average person skimming their News Feed will easily be able to digest this. 1. Don’t focus on the product: Focus all attention on the results and activity - how fun or fulfilling it is. Only mention the product as a facilitator of it. 4. Solve a Problem: Giving people cool new activities to do are great, but if you can show them how your products solves one of their problems, you’ll give them a hard reason to buy. Apart from the fact that there’s free wine - people love going on winery tours to learn about how the wine is made. When a person has a better understanding for the materials and processes used in the refining of a product they appreciate it more. It’s just like when you appreciate a colleague more when you see how much work they put into their projects. Anthropologie introduced a new collection with an interview with the founder. Founder interviews are great: they allow you to get a look at why they started the business, what their inspiration is for their products and how they choose which products to make. 1. Employee Interviews: The people behind the product are just as important as the product itself. Model them as experts and ask their opinion on the products and how they use them at home. Fans are interested in what their friends and peers are saying, not your business. They don’t want to see self-promotion, they want to see cool things that real people are doing. And customer testimonials are your way to give them that. Don’t have any customer testimonials yet? Check out our recent article, 4 Strategies for How to Get Customer Testimonials on Facebook, to get some! How do you use Customer Testimonials to Drive Sales? Don’t just have testimonials that say you products are great, or even that they’re better than your competitors. Those don’t give anyone a reason to go out and buy them. Instead, post testimonials that discuss how a person used your products to solve a problem or make their life better. Companies that sell weight-loss products are best known for this strategy. They show photos and interviews of people who have used their products to change their body and their life. They tell a story about how the product solved their problem and made them happy. This is the story you want to tell about your products. This post from Coca Cola is great. 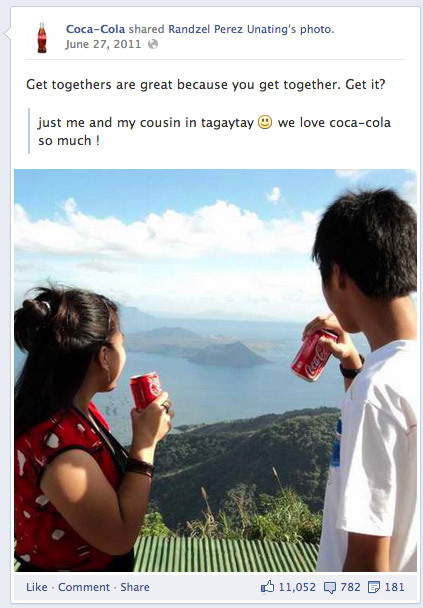 It’s a real image and quote from a Coca Cola Fan that shows a girl and her cousin bonding over a Coke. For a merchant who wants to emulate this though I would include a call-to-action to do something. A hard sell isn’t what you want, but a link to a piece of content that expands on the idea in the post would be perfect. Remember, you don’t have to go over the top. You don’t need an interview with a person overcome with tears because your product changed their like. Most products aren’t even capable of that. Show a person who used your product to overcome a common problem, even something as simple as saving time or bonding with their family. The simple problems are the ones people think about most often. Solutions to those will give you the most clicks and sales. To reiterate: It IS possible to turn Facebook Fans into paying customers. You just need to do it in ways that are much different than traditional advertising. I’ve seen many businesses that try to sell directly using posts that spout of details, specs and special pricing of their products and wonder why no-one clicks. 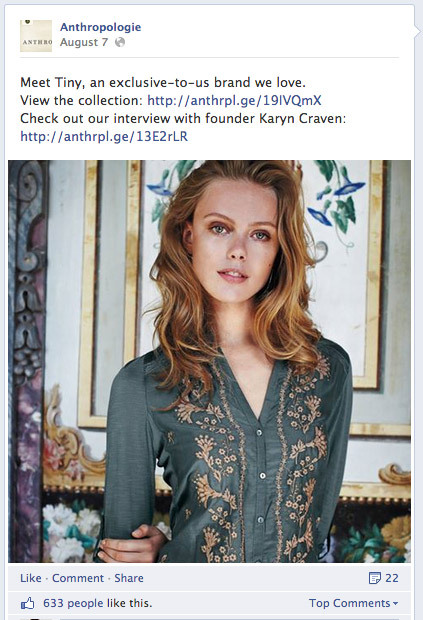 No one goes on Facebook to browse products - they go there to read stories. Tell your Fans a story and they will listen. Show them in the story how your product can solve their problems or make them happier and you will get new customers.